Red Eye gravy is a must in our house. It’s so easy to make and once you’ve had it, you’ll make it over and over again. 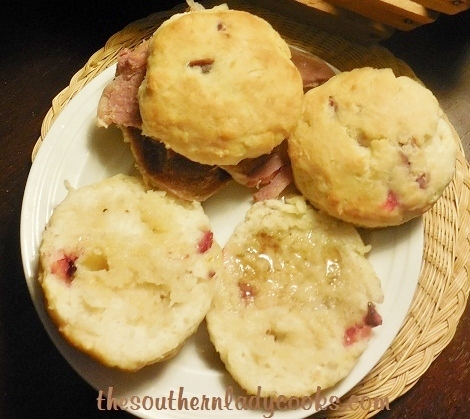 One of my all-time favorite meals for breakfast is biscuits, country ham and red eye gravy. If you are not familiar with red eye gravy, you are missing something. This makes a breakfast treat on the weekends. Red eye gravy, country ham and biscuits is the best breakfast ever! Fry the ham in a skillet on top of the stove. Remove ham from pan, add water and coffee and bring to a boil for about 2 minutes. Serve over ham slices or biscuits. (Note: If the ham does not have much fat on it and is not making any drippings in the pan, add the water before removing the ham and let simmer for about 3 minutes, remove ham and add coffee to water so that the gravy will have a ham flavor). This is a classic Southern breakfast. Breakfast at its best! Cut the shortening into the flour. Add the rest of the ingredients and enough buttermilk until flour sticks together in bowl. Turn out onto a lightly floured surface adding more flour if dough is too moist and roll out to about 1/4 to 1/2 inch thick. Cut out biscuits with cutter and place on a baking sheet that has been sprayed. Cook about 8 to 10 minutes until golden brown at 450 degrees. Makes about 15 to 20 biscuits depending on the size of your cutter. I have a question that may be both heretical and inflammatory: can I make red-eye gravy to accompany a slice of smoked (but not “country”) ham? I only make it with country ham, Hugh, but you could try and see. It won’t have the country ham flavor that I think makes red eye gravy but may have a smokey flavor. Lord I’m hungry now lol. I love this meal! The lazy cook reporting here. When this dish is prepared it is usually for a family crowd Christmas morning. I only have 4 ingredients. 24 pack of frozen buttermilk biscuits, Country ham, water and instant coffee. I pop biscuits in oven first. I get a large pack of ham 3-5 lbs and spread all of it in a large cast iron pan. Then just barely cover with water, cover and boil on medium heat for about 20-30 min. then flip all over and boil until biscuits are about 5 min to done. Then take out ham and to boiling water I add 2-4 heaping spoon full of instant coffee. We like it strong so I add 4. Stir well to get goodie off bottom. While gravy is boiling I cut up ham to biscuit size. Slice biscuits and dip in gravy, then throw on ham. We open presents while this goodie is cooking. Oh yeah! 4th ingredient – – Paper Plates! Correction paper plates are 5th and Beverly, hon, it ain’t Red Eye without coffee. how does the gravy thicken ? This is not a thick gravy. It is thin. You do not thicken it, Laura. This was one of my husband’s favorite. He was a country boy, and grew up on this. He’s in Heaven now, but now I like it just like he did. Back in “the day” at Grandmother’s house on Friday night – when my aunts and Mom all gathered to chat about going to town on Saturday – we would have either green leaf lettuce or chopped tomatoes and onions with red-eye gravy and cornbread! Recently tried the gravy with bacon — NOT the same! I grew up on a farm in middle Tennessee. My mother made this for breakfast. She did not add the coffee, so I guess its not true red eye gravy,but it is delicious. I would always pour some of the gravy over spoonfuls of brown sugar, then sop it up with hot buttermilk biscuits. Yum, I can taste it now. She would fix the red eye with tenderloin, pork chops or ham. I haven’t had any in years…will have to make some now! always loved red eye gravy made from ham drippings ,strong coffee,and served with hot biscuits,eggs and grits! This is the first recipe i have come across that makes it the way a true southerner does! I am from Va. and this is just how we make it! Can leave out the sugar in the buttermilk biscuits. Yes, you can do that, Gloria. I have a question on the biscuits. You say shortening. so do you mean by that using Crisco or Butter? I’m a beginner cook!!! It actually tastes better with lard, but that’s not good for our arteries. It’s also good when you have fried pork chops to make it with pork chop pan drippings. I just use canola oil and it goes good with my family. My mom use to make Red Eye Gravy. I never knew how it was made. Thanks so very much. Several years back a local restaurant was bought out by a Yankee family. I stopped in one morning to try their breakfast. They did have grits and I asked about ed eye gravy. The owner, his son was cooking, said they had heard the term but did not know how to make it. I tod them it was simple, ham dripping, salt and pepper, coffee and a spit of snuff or tobacco juice for the “tang”. They were delighted but questioned why on the snuff. I insisted that it was a requirement for the true Southern flavor. I stopped in a couple of weeks after that. The owner quickly informed me that they now had Red Eye gravy. I oreder flap jacks instead. Your story is SO funny!! Thank you for the good belly laugh….I needed it! I make red-eye gravy too, but not until recently did I know it had coffee in it. I have always and it and made it with just the pan drippings and water. We always called Redeye Gravy “Red Sop” in northeastern TN. I would imagine it was because we Sopped up the gravy with the biscuits. Just the pan drippings from fried ham with gravy and a little bit of salt. I found that the leftover coffee tastes even better than fresh. It’s good for supper with morning coffee in it, or for breakfast with yesterday’s leftover coffee if you have any. Sometimes you have to make it with fresh coffee, but I just thought I’d mention that leftover coffee tastes even better than fresh. I am so glad that you posted this recipe to your Facebook page! It was a simple delight for my family on Christmas morning this year! I used brown gravy instead of the “red eye gravy”… only because I am a beginner cook and my boyfriend was very hesitate of the idea. So happy you enjoyed this on Christmas. It is a tradition with my family. We make it on Christmas eve and have leftovers for breakfast on Christmas morning and have for years. Red eye gravy is a little different and kind of takes some getting used to but a Southern thing for sure. I will check out your site. Thanks for the great comment. Country Ham, Scrambled eggs, Grits, Buttermilk Biscuits and Red Eye Gravy on all of it. Heaven! Judy – thank you!!! I have been wanting to know what to do with left over coffee, and my Kentucky hubby mentioned red eye gravy! As you know am form England so was confused, am just getting used to making gravy with milk! Will make this for him tomorrow morning!!! Red eye gravy….one of God’s gifts to mankind! Not very healthy but, is great as a treat from time to time! Love Red Eye Gravy hungray now!!! Southern all the way and proud of it. Love the Southern Lady….Keep the recipes coming. Thought about that this morning, but the local smokehouse wasn’t open. I should have planned ahead. I always say that simple food is the best!! This is a classic that has not been on my plate in a long time, thanks for the delicious reminder. The south will rise again in my kitchen! Ahhhh…. My kind of food! My Dad swears his family had this for breakfast every morning!! !